Barcelona vs. Madrid - Which Do You Prefer? Barcelona vs. Madrid – Spain is an amazing country that has a lot to be proud of in terms of incredible things to do, remarkable places to revel in, and a rich culture to soak up. Travelers who want to venture to the beautiful land of Spain are usually confronted by a dilemma of which city to visit between these two, and weighing down pros and cons can be a feat, since both have so much to offer, and both are remarkably different from one another. What is evident between this Barcelona vs. Madrid battle is that it all really boils down to personal tastes—ask yourself what is more important to you, and what are the things you find yourself you enjoy doing the most when you travel. Do you prefer a bustling, active nightlife, or visiting museums? Do you thrive in busy, edgy, urban atmospheres, or prefer a laid back vibe by the beach? Both cities are great on their own, which makes deciding between the two of them immensely difficult, and a common debate between travelers. But, if you don’t have the time or resources to pull off both cities during your trip to Spain, hopefully this article will help you decide which city will be more enjoyable and worthwhile for you. Barcelona is located on the northern part of Spain in an autonomous area in the Mediterranean, and it is closer to the border between Spain and France. Barcelona is a larger city, with beach scapes and surrounded by a mountainous area. It experiences a subtropical Mediterranean climate, featuring humid summers and rainy seasons. Spain’s capital Madrid is quite landlocked, as it is located in the geographical center perched on top of a plateau, and it is also the highest capital in Europe. With this said, climate here is extreme, and Madrid experiences really chilly winters and very hot summers. Madrid’s city center is much smaller than Barcelona as well, but you can arrange several trips to other parts of Spain such as Salamanca, Segovia and Toledo, using Madrid as your home base. Both cities have great international airports that do service a great deal of international flights, but if you’re travelling by land, and coming from France and nearby European countries, you can easily rent a car and drive there and cross the border yourself, or you can take a train or a bus. Barcelona is a great, convenient stop for travelers who are doing a land-based Euro trip. Since Madrid’s location is higher and more centralized, unless you will be flying going here, it will take you more time to go to this city land-based as it is further away from the rest of the Europe. The most common thing people will instantly associate Barcelona with is with the mention of Antoni Gaudi, a world-renowned architect noted for his remarkable stunning Art Nouveau buildings found all over Barcelona, such as La Sagrada Familia Cathedral, and several structures ranging from parks, to residential buildings, which all have Gaudi’s signature style and masterful details. Gaudi’s architecture alone is worth visiting Barcelona for. Barcelona also has a lot of beaches to soak up some sun in, and this is what greatly differentiates the two cities apart. Madrid, on the other hand, is a very classy city that has beautiful, majestic European architecture, numerous historical sites, ancient buildings, grandiose Madrid museums such as Museo del Prado, which is the second largest in the world. Madrid’s streets are considered more picturesque and charming than those of Barcelona’s, and this city is one that begs to be explored on foot as it is very, pleasantly walkable. The whole city itself is both complex and beautiful with a distinct Spanish authenticity. Barcelona is notable for having a topnotch nightlife, with its beautiful discotheques, and its party nature. Since there are beaches here, spending time under the sun along the shore is a major feature that the other city does not have. The atmosphere in Barcelona is more sophisticated, cosmopolitan, and the vibe is more European. It’s also more expensive to travel here. Madrid, on the other hand, offers a lot of cultural activities such as musicals, theater, great art at the Reina Sofia, flamenco, tapas bars, and charming cafes. The overall vibe here in Madrid is decidedly more Spanish in terms of its gems. While you can’t hit the beach in Madrid, you can revel in its many beautiful parks. In terms of nightlife, both cities have an active, bustling nightlife that will blow you away. The great distinction between both, however, is who are the ones doing the partying. Since Barcelona draws in more tourists, its partying is also done mostly by the tourists, so the scene is more international. In Madrid, naturally ingrained in the nature of Madrilenians is partying, so the party scene here is more local, and more vivacious and authentically Spanish. Both places will not have a shortage of exciting things to offer, and food in both cities are incredible. Mealtimes in Spain come much later than the rest of the world, as its commonplace here to have lunch at 3pm, whilst dinner can be as late as 10pm. Going to bars can commence around 12pm to 2am, until the wee hours of the morning. In both places you will be introduced to the culture of having tapas, which are small plates of food with either meat or seafood to be eaten together with friends and colleagues. The Spanish are a remarkable people, and are considered to be people who are fun, and they love celebrating the good things in life. This is evident in their culture of siesta, drinking, vibrant nightlife, and numerous celebrations. Barcelona and Madrid speak different languages, as Barcelona speaks both Spanish and Catalan, while Madrid speaks Spanish. If people’s warmth and friendly nature is important to you when traveling, Madrid is the place for you, as the Spanish here are generally more helpful and forgiving towards tourists. In Barcelona, people can be quite unfriendly and rude, as a lot of tourists have mentioned. As far as crowds go, Barcelona is way more touristy and is far more crowded than Madrid. Getting around the city is convenient since both cities have an excellent underground metro station, and the high-speed Eurorail. Tourists will find the metro system easy to navigate. However, Madrid’s metro is better in terms of quality, cleanliness, timeliness, and efficiency. Both cities also have buses and taxis aplenty. The bus is priced averagely, but will require you to speak a bit of Spanish for you to easily get yourself from one point to another. While both cities are both in the list of the top most expensive cities in the world and neither are cheap, a lot of tourists do say that Barcelona will set you back by just a little bit more than Madrid. However, this may be because Barcelona as previously mentioned, can be quite the tourist trap. There aren’t vast differences between one another in terms of prices of commodities. It largely depends on what you intend to do in each city, in which your preferences will also determine the perceived value of money in this places. However, if you are wondering if both cities can be good for budget travelers, the answer is that it can be, if you compare it to the other countries in West Europe. A conservative budget to set aside in both cities is around €50/day, but it’s very possible to get by with less than that amount if you decide to be more frugal. There has been a long standing rivalry between Barcelona vs. Madrid, not only between locals but also between loyal visitors who all praise that their favorite is better than the other for one reason or another. So let’s stir it up a bit and compare the cities with this cool infographic from HostelBookers 😛 – where would you prefer to go? Barcelona is a city where the mysterious past and the sleek future mingle in perfect harmony. Around one corner visitors encounter structures that have stood for more than four centuries. Around another, they stumble across the jaw-dropping, modernistic marvel that is the Design Hub. It’s a place where people can wonder at the genius of Picasso by day and dance the night away under a gorgeous Spanish sky at one of the many clubs. Barcelona is bursting with life of all sorts and descriptions. It’s no surprise that so many people are anxious to return. Barcelona’s population of about 1.8 million genuinely enjoy the good life. Their ancient city is perched on the gorgeous Mediterranean Sea, giving it summers that are dry and warm. Even winter is beautiful when you visit Barcelona. Mild weather prevails, and it’s not unusual to experience high temperatures of 63°F during January, the coldest month. No matter the weather, Barcelona is a hive of activity. It thrives on commerce, with manufacturing and tourism being major industries. However, it’s also an exceptionally artistic destination. Some of history’s greatest artists have called the city home. Many of today’s foremost artists continue that tradition by taking advantage of the community’s creative energies. Barcelona is regarded as one of the most livable cities in the world. Locals enjoy a particularly high standard of life, and that’s something that visitors can take advantage of too. Enjoying the good life in Barcelona starts with selecting the right accommodations. HCC Ciutat de Berga just might be the best value in the region thanks to its amenities and outstanding location. The hotel is found to the northwest of central Barcelona in the charming city of Berga. It’s a city like Barcelona that comes right out of medieval times, yet manages to balance a thriving textile industry with ease. Visitors love being able to stay at the Ciutat de Berga. Its excellent location puts Barcelona, France and Andorra all within easy reach. Yet this hotel is attractively affordable. There’s simply no hotel close in to Barcelona that offers so much for such inexpensive rates. Each room at the Ciutat de Berga is generously proportioned and features the modern amenities that today’s traveler has come to expect. Free WiFi means guests can always stay connected while a high end heating and air conditioning system guarantees comfort no matter the weather or the season. Rooms are equipped with full, private baths. A complete array of toiletries is at hand in case anything has been forgotten at home. A breakfast buffet is the perfect setting for planning a busy day of sightseeing. The friendly, informative staff is ready to answer questions or help guests figure out which attractions appeal to them most. Bar and cafe service are available for the comfort and enjoyment of every guest. Onsite parking facilities are secure and convenient. Thanks to all of the thoughtful details at this hotel, guests are free to enjoy the region after a pleasant night’s sleep. That is excellent news, because Barcelona is teeming with marvelous sights that deserve to be seen. Most tours should begin with a stroll down La Rambla. By far Barcelona’s most famous boulevard, La Rambla stretches for a fascinating kilometer of performance artists, restaurants and attractions. It’s the location of the monument to Christopher Columbus and the excellent La Boqueria Food Market. Everyone should take a moment to drink from the famed Canaletas fountain along the way. It’s said that a sip of water here ensures a return to Barcelona. The exploring only gets better in the El Born neighborhood. It’s one of the city’s oldest quarters, dating back to the medieval era. Back then the dark and twisty streets were lined with artisan’s shops. The scene is more upscale today, although it’s still possible to find outstanding shopping here. This is also an excellent district for museums. The Picasso Museum, with its collection of some 2,400 works by the master himself, is found here as is the interesting Textile Museum. In a city as ancient as Barcelona, it’s only natural that museums command a special place in the hearts and minds of locals and visitors. Perhaps the best of these is the Museu d’Historia de Catalunya. A fascinating exploration of the city and Spain, a visit to this museum is an absorbing journey through the past. The marvelous permanent exhibitions and rotating displays are worth of hours of examination. Visitors come away with a unique perspective on the city and the people who live there. Barcelona is a destination that offers something for everyone. From a pulsing nightlife to awe inspiring museums, it’s a city that’s worthy of a repeat visit. With excellent accommodations at HCC Ciutat de Berga Hotel, visitors are prepared to fully experience this colorful and majestic city. The second largest city in Spain, Barcelona differs from other Spanish cities as it is not blistering hot in summers. Many locals go out of town from late July to early September, making the city quieter and less populated. Barcelona offers a relaxing mix of everything Mediterranean, which includes months of warm sunshine, delicious food and relaxed pace of life. The huge pedestrian-only boulevard running from Plaça Catalunya to the sea is lined with gorgeous buildings and restaurants. The place is especially crowded during summer. Street performers and, kiosks selling food, flower and souvenirs occupy the road. Designed by Gaudí, the park was originally meant to be a ‘garden city’, a place where workers could live. A section of the park offers amazing view of Barcelona’s skyline. Parc Guell is a charming blend of mosaics, garden and fairy tale houses. The site of the 1992 Summer Olympic opening ceremonies, this area has museums, gardens and the National Palace. Magical Fountain however is, no doubt the most popular with tourists. The National Art Museum of Catalunya, located on Montjuic, is free on the 1st Sunday of every month. Spend your time swimming, sunbathing or just taking a stroll along the shore. Spains beaches can be crowded in summer but are still worth a go. Take a stroll along the promenade to enjoy the enchanting view of the blue waters of the Mediterranean. Some of the finest work of the famous Catalan architect, Gaudi, can be seen for free (from the outside) around the Eixample district. The works include La Pedrera, Casa Batllo, and the incomplete La Sagrada Familia with La Sagrada Familia, possibly, the most recognized landmark in Barcelona. Museums such as Museu Picasso, Museu Barbier-Mueller d’Art Precolombi, and Museu d’Historia de Catalunya are free on the first Sunday of each month. Museu Maritim is free on the first Saturday of each month while the Museu de la Xocolata (chocolate museum) is free on the first Monday of each month. The medieval cathedral, built during from 13th to 15th Century, boasts a Gothic facade, chapels, vaulted interior and has a pretty garden and cloister. The most central park in Barcelona, it covers an area of 74 acres and houses a lake, zoo and many museums. The flowerbeds, palm tress, walkways, fountains and sculptures make the park a sought after place in the crowded city of Barcelona. One of the many famous festivals in Barcelona is Festa Major de Gràcia – a week long community celebration in the streets of Barcelona. For this, streets in the Gràcia area are decorated by its residents depicting colorful themes. At the end of September, the five day long Barcelona La Merce Festival takes place. The festival is a great family event. This feud could, and probably will, go on forever. There are good and bad things about both cities, and depending on what you want you will find that one city fits your needs better. As both cities are extremely popular, you would think that when it comes to finding Cheap Hotels, Barcelona and Madrid would disappoint – but this is surprisingly not the case. There are many cheap hostels and restaurants to keep your wallet happy. Another factor we would like to add to this inforgraphic is the “entertainment” factor – Madrid has the better museums, where, for the record, two of the best are free every night of the week. But Barcelona has that “wow” factor with incredible architecture that you see by just walking down the street. Its amazing how 2 cities can be vastly different from each other, and these differences make each of these two places unique from one another. It needs to be noted here that because Barcelona and Madrid have had different histories, there is an ongoing rivalry between them until now between the Madrilenians and the Catalans, for many reasons that go down deep in history. However, like what has been stated in the start of this article, it all greatly depends on what your preferences are. Barcelona is great for people, who prefer an active, more European vibe. It’s for lovers of the beach and the sun, and though this place is heavily touristy, it is touristy for great reasons, most notably the architecture that’s definitely not to be missed. Madrid is a city that’s for lovers of culture and art, and those who decidedly want a more authentic and classy urban-meets-old world Spanish experience. It’s a place to immerse yourself in if you would like to absorb more of the vibrant cultural scene and its people. Whichever your choice is between who wins the Barcelona vs. Madrid debacle, there are no wrong choices to be made either way. Both cities are great on their own, and they just happen to be in the same country, which is why it is inevitable not to compare them to one another. Things To Do In Madrid, Spain – Madrid is a vibrant city with huge contrasts and diversity; 17th century buildings line up along cobble stoned lanes, next to sky scrapers and wide shopping boulevards, the bullfight traditions live on together with gay pride festivals. The list of things to do in Madrid Spain are endless, but we’ll try to sum it up with a few of our favorite picks to give you a good time. A visit to Palacio de Real, the royal residence and gardens, should be high on your list of things to in Madrid. It is one of the the largest royal palaces in Europe, and 50 of the 2,800 (!) rooms are open for the public. But it’s not so much the sheer size of the palace, but its stunning architecture, that makes the biggest impression. The rooms inside, such as the royal pharmacy, the porcelain room, the clock room (I guess they had to find some use for all the rooms) are quite impressive, but unfortunately you’re not allowed to take any photos. Avoid visiting on Wednesdays as that day is free entry for locals, so it tends to get very busy! Madrid has some of the best museums in the country, not to mention Europe, that will make even the museum-hater want to visit, especially considering that many of them are free at different days and times of the year. Out of all things to do in Madrid, a visit to the Prado museum is the most popular. The Prado has one of the most important collections of 14th-19th century European art in the world, and while the entry is €10 during the days, from 6pm-8pm entry it’s completely free (and apparently also free for “unemployed”). Other great museums to check out and to give yourself more things to do in Madrid are Museo Thyssen-Bornemisza, Reina Sofia and Sorolla museum. One more place that cannot be missed in Madrid is the main square – Plaza Mayor. It is the classic meeting point for everyone in Madrid, and a great place for people -watching. This is where the action is, where festivals and concerts are held, and the perfect starting point for exploring the city. 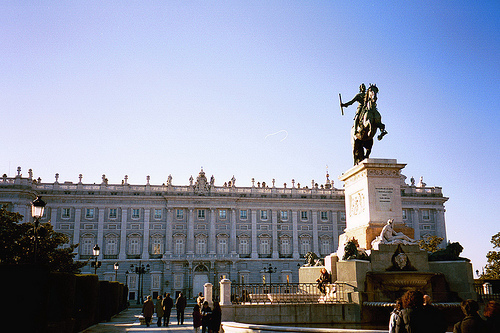 The square surrounded by Baroque buildings and over 400 balconies was built by order of the Spanish King Phillip III. It was designed by Juan Gomez de Mora, the most famous Spanish architect of the 17th century. Architecture and culture in all honor, but one of the most fun things to do in Madrid is to experience the awesome nightlife and amazing cuisine. 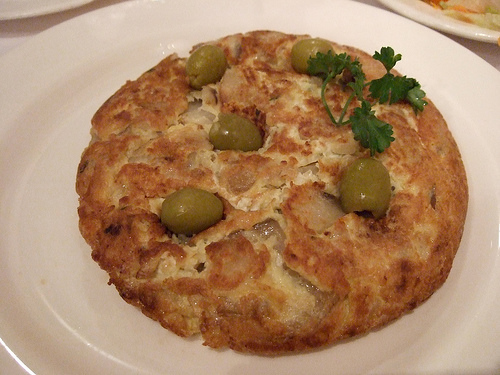 They say that Madrid is the most Spanish of all cities, and when it comes to cuisine, this is definitely true. Going out for tapas (ir a tapear) in Madrid, has become something more than just dining out – it’s a “tapas crawl”. Just like with bar crawls, you seek out the specialties of each tapas restaurant, have a few picks, wash it down with alcohol, and move on to the next bar. There are many little cafes and bars where you can have a drink or even a full Spanish meal for a reasonable price, such as Acostiña Madrid, not far from the main square. A visit to Madrid wouldn’t be complete without seeing the fabulous fountains; fountain of Cibeles, Neptune fountain, fountain of Apollo and of course The Fountain of the Fallen Angel (the only statue to Lucifer in the whole world) are all worth a look. Madrid is often described as an “open air museum” as every building and every statue in the city is a real masterpiece. Everything in the city reminds us about its glorifying past. Other beautiful places to relax are the green, lush parks in Madrid; especially Retiro Park – a big park where locals and tourists alike relax in the shade with a picnic. Madrid is the vibrant capital city of Spain, all day and all night long. Madrid is a city that would require years to satisfactorily explore. Its lengthy history, mysterious cobbled lanes and startlingly modern skyscrapers beckon to tourists from the world over. However, most people only have a few days to delve into all that this quintessentially Spanish city has to offer, making it imperative to identify its must-see sights and attractions. While it might not have the architectural wonders of Barcelona, this is where the true Spanish culture is most vibrant, and there are many ways to soak up the Spanish culture, history and atmosphere. Whether you want to spend your days gazing at awe-inspiring 17th century cathedrals or looking for fantastic bargains at the Rastro, you’ll find something fascinating around every corner. This is one city where the ancient and the modern sit comfortably side-by-side. It’s possible to enjoy the traditional spectacle of bullfighting by day and then patronize some of the most cutting-edge clubs at night. Experiencing it all is impossible. Still, there are a few sights that most people agree are the ones that visitors shouldn’t miss. One of these is the Museo del Prado, Spain’s national art museum. It is the Louvre’s rival in every way with its stunning collection of European art ranging from the 12th century to the modern day. Established in 1819, the Prado quickly made a name for itself as the showplace for Spain’s great artists. It maintains that reputation although the collection’s depth has grown considerably. Not far from the Prado is the National Archaeological Museum. It houses collections that were once a part of the Prado but had to be moved to make additional space for art galleries. This other museum features fascinating collections of art and artifacts from Mesopotamia, Rome, Egypt and Greece. Together with the Thyssen-Bornemisza Museum which is where the Prado moved much of its works by Dutch, German and other painters, this complex makes for a fascinating day of exploring art history. If seeing a castle is high on your list of things to do, you won’t want to miss the opportunity to explore the New Castle of Manzanares el Real. Built in the 15th century and situated only 30 miles north of the city, the castle looks precisely as a fairy tale edifice ought to. A breathtaking backdrop of mountains and a sparkling reservoir provide the perfect setting for the crenellations and ramparts of this classically-designed castle. The village of Manzanares el Real is equally charming, offering a wonderful day trip for lovers of history and culture. Authentic Madrid can be experienced at Plaza Mayor, a one-time food market that is now the ideal spot for al fresco dining, people watching and souvenir shopping. Thanks to its excellent acoustic properties, this is also one of the best places in the city to listen to live music. Visitors seeking unexpected or unusual bargains won’t want to pass up El Rastro found just south of Plaza Mayor. At this outdoor market shoppers find antiques, junk and everything in between. Whatever you’re looking for, you’re certain to be entertained. Madrid is a wonderful city for enjoying tapas, watching exciting flamenco dancing or getting familiar with bullfighting. Whichever adventures you choose are destined to be memorable. Madrid has perhaps more tapas bars than any other city in Spain, and one of the best ways to indulge in these delicious delicacies is to go for a tapas bar crawl. You see, every tapas bar is famous for their own specific dish, and rather than picking one place, it’s better to have one dish at one bar, then go to the next for their specialty, and then to the next. That way you also get to see more of the city and explore different bars and meet lots of people. The colorful, joyful flamenco can be experienced in many venues across the city. To get the most authentic experience, watch it at a tablao (restaurant with a stage). The highlight of the shows are past midnight, which may sound late to many tourists, but it’s actually not until then that the nightlife truly begins in Madrid. Madrid is a great shopping city in general, but when it comes to shoes, it is one of the best in Europe. The street where you will find the best buys is along Augusto Figueroa, in the heart of Chueca, which is lined with outlets for factory samples. Some great shoe brands to look for are Farrutx, Camper and Lowee. One of the most beautiful places in Madrid is the Parque del Oeste in Argüelles, which is a favorite among locals to hang out and relax on sunny summer days. During summer the whole park smells of roses from the huge blossoming rose garden, and every year there is an international rose contest taking place there. The park also has views over the Palacio Real and the Egyptian temple Templo de Debod. Spain prides itself on its unique and distinct cuisine, and while their hearty meals will certainly fill you up, we do recommend that you save some space for the desserts – because they’re absolutely amazing..! Flan is a type of egg custard topped with caramel sauce. It’s jelly-like in texture, and melts in your mouth. It’s one of those dishes that you’ll be able to finish no matter how full you think you are after the dinner meal. This is the Catalan version of crème brulée, with a crispy top of burnt sugar, and a soft pudding inside. Generally prepared on Spain’s Father’s day, but you can find it throughout the whole year as well. Turrón is a very old traditional sweet of Moorish (Arabic) origin. This almond candy / nougat treat is a typical Christmas sweet in Spain. While almonds and honey are the main ingredients, it also comes in many different flavors and varieties. Spanish fritters have to be among the best fried snacks there is! Light and fluffy, these fritters filled with egg custard, marmelade or pastry cream literally melt in your mouth! Another Christmas cookie, the Mantecados are a favorite among locals and something to look forward to every winter. The rich crumbly cookies have that significant anise flavor that few other cookies manage to balance this well. Polvo is the Spanish word for dust, and as the name suggests these cookies are very dusty and crumbly in texture. They’re soft and heavy, made of flour, sugar, milk and nuts – and are very easy to make. Although traditionally a Christmas cookie, people eat these all year round today. These are just a few out of many delicious Spanish treats and desserts, you can enjoy in Madrid or Barcelona! I lived and worked in Madrid and did business in Barcelona and I don’t hesitate when I say Barcelona is my favorite! I have been in Madrid a month but haven’t visited Barcelona yet so I don’t have a personal opinion. However, I can say that in my travels in other parts of the world it seems that non-Spanish backpackers seem to prefer Barcelona. On the other hand, my friends here in Madrid (admittedly biased, but many have lived in both cities) Madrid is the better of the two, especially for everyday living. Thus far, I really do like Madrid. Loved the previous comments and so glad we chose Barcelona as part of our honeymoon in August /September – cant wait ! !